Drug: Drug is defined as the all chemical or natural substances capable of being used for therapeutic purposes. The expression Drug also includes narcotics, etc. 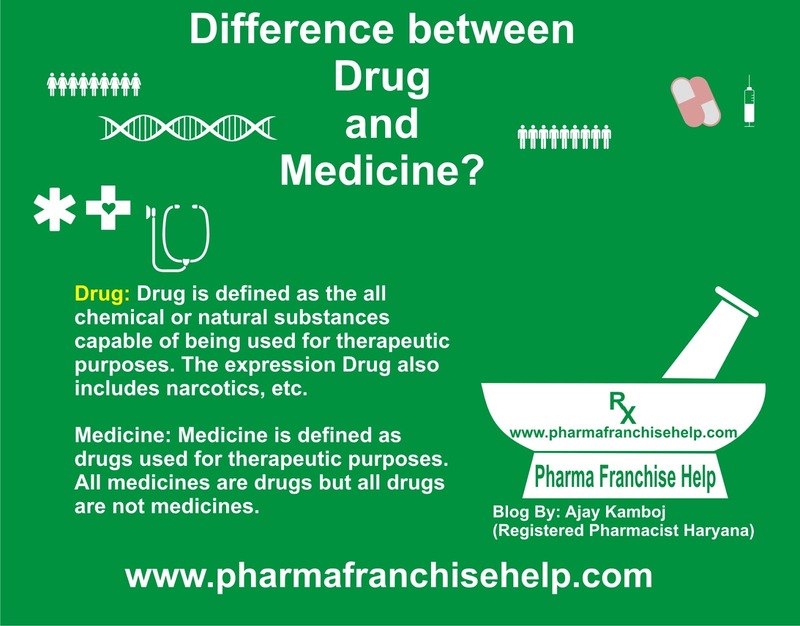 Medicine: Medicine is defined as drugs used for therapeutic purposes. All medicines are drugs but all drugs are not medicines. Suppose we have five substances named as X, Y, Z, A and B. These five substances have different properties. These substances may be natural, semi-synthetic or synthetic and/or chemical in nature. All substances have therapeutic properties for management of Pain, inflammation and Fever. In technical language these substances are Analgesic, Anti-inflammatory and Anti pyretic therapeutic action. By Therapeutic action, one thing is clear, all four substances could be classified as Drug. Then what will be the criteria for a drug to become a medicine. Now elaborate other properties of substance X,Y,Z, A and B. Along with above mentioned therapeutic effect, X is a Steroidal drug having potential side effects, due to which X is not using in treatment, cure and management of any disease. Y is an Non steroidal Anti Inflammatory Drug (NSAID) which requires more trials and research to be launched into market. Z is a drug substance claimed for Analgesic, Anti-inflammatory and Anti pyretic therapeutic action but scientific data or literature for supporting this claim is not available in any type of therapy. A is a NSAID which is used for claimed indications by healthcare professionals. B is a steroid drug which has serious side effects but any other substitute is not available and use for claimed indications by healthcare professionals. Form above five which drugs fulfill the criteria to become a drug. Drugs which are still used for claimed indications by healthcare professionals. Now we got the point. X,Y,Z,A and B are drugs but only A and B are used for claimed indication for curing, treating and managing any particular disease and/or condition. So, A and B will be termed as Medicine also.